Once was a time when I attended church for the singing. As I matured, I learned to love the sermons as much as the singing, but a few weeks ago, I realized that I now to go church despite the music. I had attended our church’s “Old Fogey” service (i.e. hymns and old praise music vs. the more contemporary songs) despite my young years and fell in love with the depth of the lyrics. Several months ago, the hymn service, poorly attended, was canceled. I had to attend the services with what some jokingly referred to as the 7-11 songs — 7 lines repeated 11 times. The music seemed to focus on different ways to express God’s love for us and seemed rather repetitive. “I Could Sing of Your Love Forever” was not just a song, it was the theme for every service… Singing of God’s love forever and ever and ever… To that apparent lack of depth I added more complaints: The lead singer sang so high I had to either sing like a nightingale or drop an octave and sing like a man; I didn’t have an ear to harmonize. So I considered solutions — such as arriving late each Sunday to purposely miss the singing. It didn’t seem to be a good choice. In the midst of my discontent, I considered that songs aren’t the only form of worship, and as I rethought worship, I realized that my purest form of worship hadn’t necessarily ever been associated with singing at church, as much as I have often loved it. I worship God when I open my heart to Him — whether I am seeking Him in desperation, joying in an acute awareness of His presence, awing over how well He knows me, reflecting on His incredible goodness, laughing at His sense of humor, seeing Him in His amazing creation, glorifying Him intentionally or by simply attempting to do what He has called me to do and be. It is when I give Him my all, when I acknowledge that He is my all, when I allow Him to speak through me, to use me, to guide my thoughts and my behaviors — and my writings. Often my blog posts are a product of this personal worship, evidence to me that worship is so much more than a song. So with this conviction, I entertained being content with my discontent. I felt my worship was rich, after all, even when not set to music. I have been reading through the One Year Bible, which allots specific chapters and verses from the Old and New Testaments and Psalms and Proverbs for each day of the year. So far, the bulk of my Old Testament reading these summer months has covered the good king/bad king stories in 1 and 2 Kings and, seemingly repeated, in 1 and 2 Chronicles. Like my feelings about the singing at church, I was somewhat discontent with the assigned readings — the kings’ names were (somewhat) changed but the stories were the same. Good kings = blessings. Bad kings = curses. I felt tormented by having to read about the same good kings/bad kings as I disciplined my way through Chronicles. 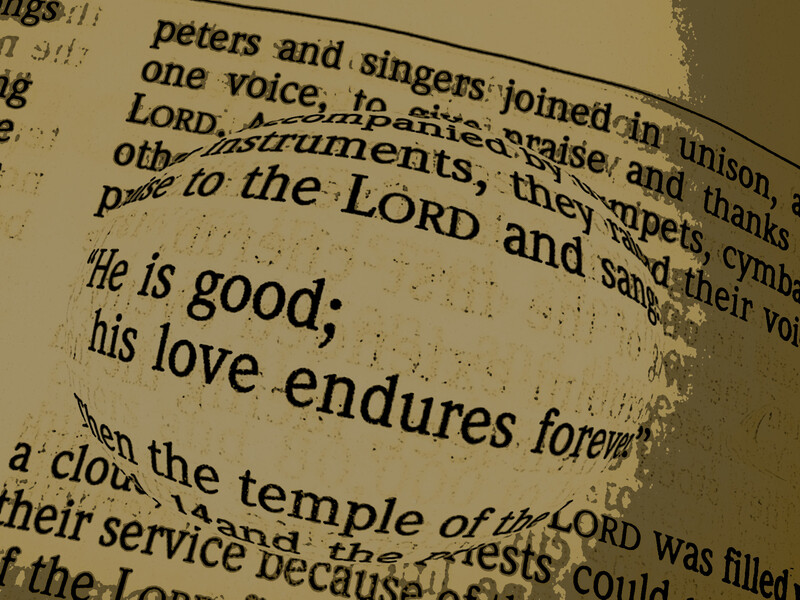 And the lyrics to their song, “He is good; his love endures forever,” which so filled the temple with God’s presence that no one could do anything but worship, made me laugh at my summer’s discontent over the “7-11” songs I had mocked as lacking depth. These seven words — I see no record of any other worship songs at this particular service — filled the temple with the glory of God, a cloud. And all the people gave a great shout of praise to the Lord, because the foundation of the house of the Lord was laid (Ezra 3:11). Ezra led the people in rebuilding the temple of God that had been destroyed in earlier years after the sequence of good kings/bad kings and the consequences that followed. Just laying the foundation of the temple brought them great joy, and they remembered to give thanks to God because His love toward them endures forever. 37 Jesus replied: “‘Love the Lord your God with all your heart and with all your soul and with all your mind.’ 38 This is the first and greatest commandment. 39 And the second is like it: ‘Love your neighbor as yourself’ (Matthew 22:36-37). The funny thing? When I went to church last week and we sang about love, it brought me to true worship. I shed some tears but mostly bore a smile as I tried to sing because I knew I’d been gently schooled by God — not just to participate in the singing at church, not just that worship is so much more than a song, but that worship is just loving God and acknowledging His love for me. And that thought alone — His love — whether summarized in seven words or seven lines or even no words at all is enough to bow my haughty heart in worship.